Control Group, a US-based provider of printed packaging solutions, has installed a new Nilpeter press to boost its label and flexible packaging production capacity. The company invested in Nilpeter’s 22-inch FA-6* press, which will complement its existing Nilpeter’s FA-Line and a 16-inch FG servo press, to achieve an even higher quality of label and flexible packaging production. Control Group offers specialized printed packaging solutions for customers in the pharmaceutical, healthcare, nutraceutical, cosmetics, and personal care markets. 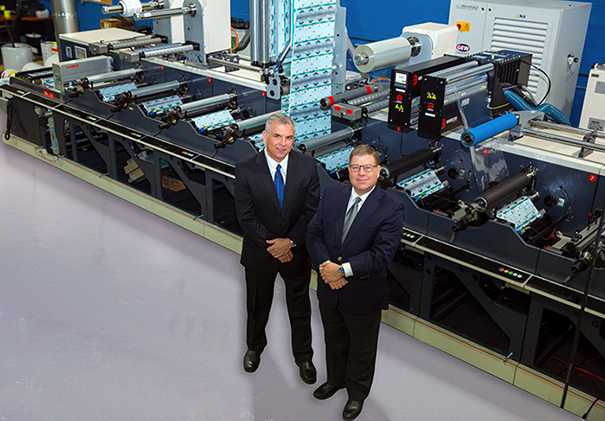 Control Group COO Jim Imburgia said: “Our first purchase was the 16-inch FG servo press. Being the first press built in that product line we expected to have some issues, but true to the Nilpeter name it was installed, and we were producing within a week. Purchased during the recently held LabelExpo Americas 2016 event, the 22-inch FA-6* press features Clean-Hand Technology, which is said to be perfect for evolving workforce and product innovation, Imburgia added. The 22-inch FA-6* is expected to allow Control Group to take their production and product offerings to another level, the company said. The Nilpeter FA-6* flexographic press features a Nilpeter Cleaninking System and a Nilpeter Powerlink control system. Image: Officials from Control Group and Nilpeter. Photo: courtesy of Nilpeter A/S.